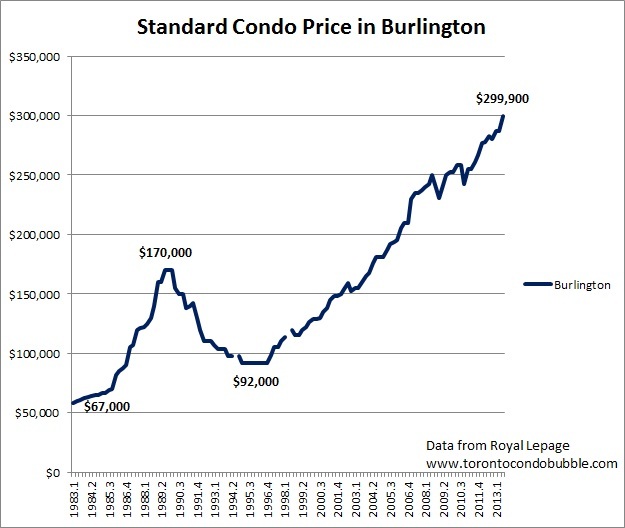 Condo bulls say that the current condo market is not a bubble because prices did not rise as fast as they did during the bubble in 1980s. 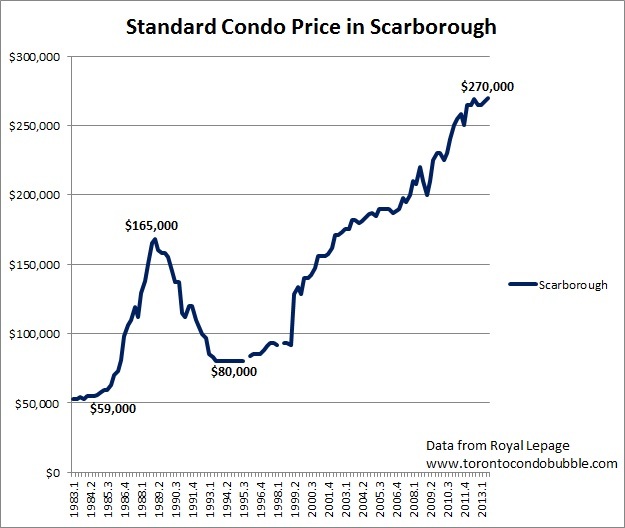 Toronto condo prices more than doubled between 1985 and 1989. During the current boom it took a decade for prices to double in the GTA (based on TREB data). But does time-span even matter? It would if incomes were playing a catch-up game - which is not the case as wages have remained stagnant. What really matters is the end result. Go to a dollar store and buy soap bubbles. If you blow hard and fast the bubbles formed would be small and pop quickly. However if you blow slowly and patiently you can create a truly enormous bubble. Now some people say that you can only spot a bubble in retrospect. Hence it's not really a bubble until it bursts. Realize that people who usually push this myth are the ones working in the banking and real estate industries. There is tons of money to be made during asset bubbles. Developers and brokers make money on the selling side and when the bubble bursts they are not the ones facing losses. It is Mario the taxi driver who, as a condo investor and landlord, lost all his life savings. Mario may decide to complain and ask for compensation from a developer who advertised magnificent investment returns. But instead of an apology and a compensation paycheck, Mario is likely to hear the developer's excuse of not seeing a condo bubble back in the day. 'No one saw it coming'. In my opinion, anything that the banks say that gets picked up by mass media or any report that vested interests publish and label as objective should come with a giant warning sign similar to the one on cigarette packs. 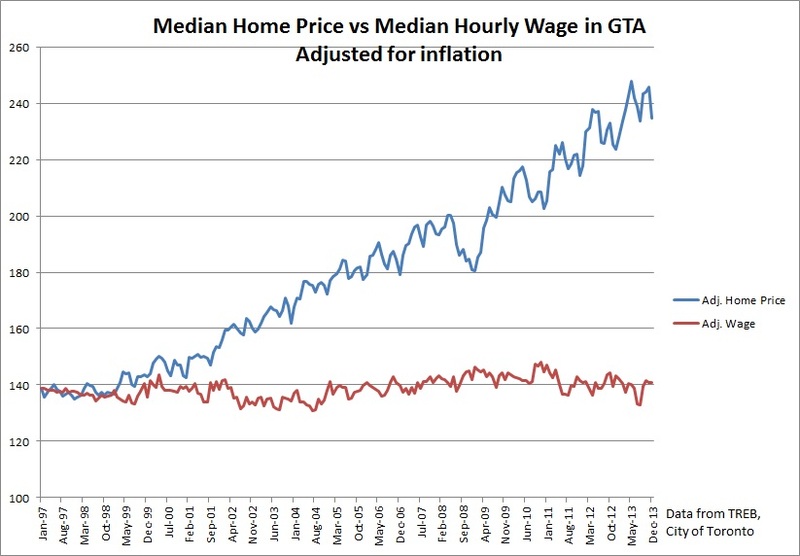 Then there are people who say that yes, housing values are somewhat overstretched in the GTA. 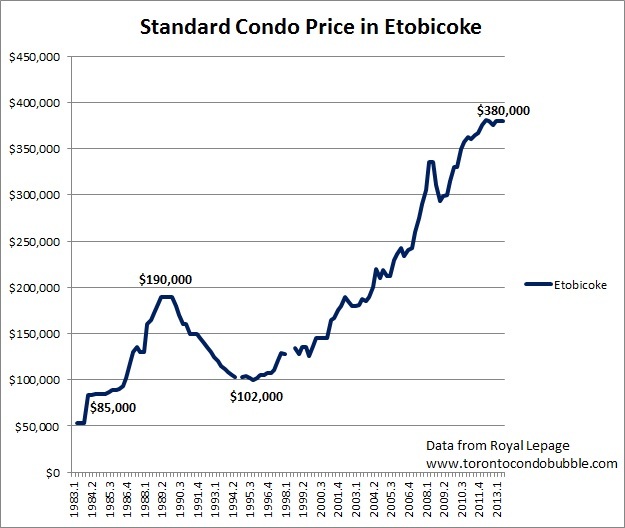 They would even agree that the Toronto housing market is as overvalued to incomes as back in the late '80s. But then they point to the one vital difference. Interest rates are currently one third of what they used to be in the late '80s. A conventional 5 year mortgage rate was 12% back in 1989. Currently a posted rate is just above 4%. Now you might think 'oh, thats explains everything! We are going to be fine'. Lower mortgage rates does not necessarily cut that real expense of paying off your loan. 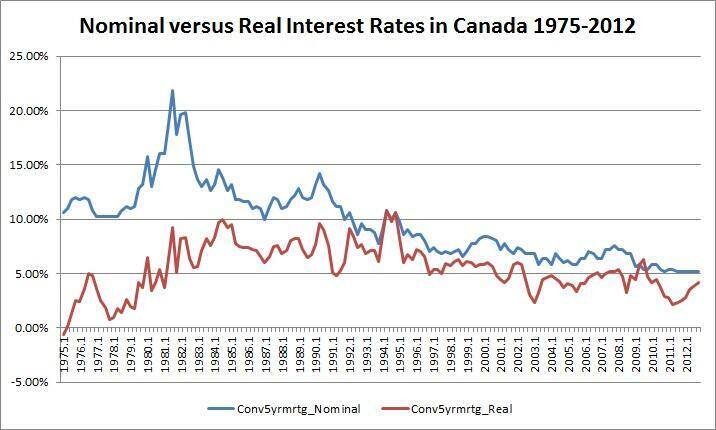 A huge part of the reduction of interest rates since the late '80s reflects a fall in inflation. During late '80s inflation was running above 5%. In December 2013, inflation was 1.2%. Keeping everything else constant, this has an effect of simply shifting the profile of payment over the life of the loan. High inflation erodes the real (adjusted for inflation) burden of the debt quickly; low inflation erodes it slowly. But the real cost of paying the loan is the same in both cases (in the above hypothetical scenario). Now in real life things are a bit more complex as there are many more variables at play. However, the point is that when you account for inflation the difference in mortgage rates between the late '80s and today is not that big. The final caveat about the low interest rates argument is that borrowing costs are low as a result of a financial emergency in 2008. If you got into an accident and injured your lungs you would be put on a ventilator. As a result your condition would stabilize and for the time being everything may look okay. But remove the ventilator and you are toast. Hence playing the low interest card as a counter argument against the presence of a housing bubble is not convincing to say the least. Is There a Housing Bubble in Toronto? What Will $300,000 Buy You? 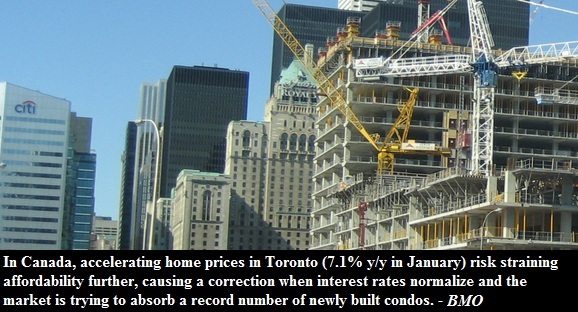 Will 2015 be the year the Toronto Condo Bubble pops? Who Are The Real Estate Doomers? Is There a Housing Bubble in Canada? The information presented on this website is purely for entertainment purposes and should not be considered as an investment advice or any kind of advice at all. Statistics presented on this site are not guaranteed to be accurate, and there could be errors in the information presented on this site. However authors do try to present information as accurately as possible. The opinions of the authors and commentators are just that, opinions! Please always make up your own mind about things in life, and never take things for granted, including on this site. Hope you have a great day! You can reach the authors of this site by emailing to: torontocondobubble (at) gmail.com Authors of this website try to cite all their information sources to the best of their abilities. If for some reason you believe we infringed on your copyright, please email us and we will fix it as soon as possible!